From humble beginnings as a saddlery in Adelaide, the Holden name quickly became synonymous with engineering innovation, industrial pride and Australian ingenuity. The newly created Trafalgar Holden Museum opened on the 18th October in 2014 and helps tell that remarkable Australian story. See over 60 vehicles on display and memorabilia from Holden's distant past, motor vehicles bodied by craftsmen and later designed right here in Australia. Housed in a restored dairy factory built in the 1920's the museum is run by volunteers eager to preserve our national heritage. Peter and Anne McCabe and many more volunteers have spent over 18 months to restore this old factory to its former condition. There is the EJ Cafe, memorabilia, gift shop and a theatre to watch the Holden History. These other volunteers that have made a contribution include: Terry Stephens, Justin, Darren & Bree McCabe, Ken Mills, George Tags, Ian Selby, Peter Tuck, Diane Watson, Peter O'Connor, Darren Lawrence, Craig & Vickey Duncan, Leno Mininchello, Karen & Dennis Jones, Mick & Gleny Brennan, Richard & Bev Sharman, Neil Titford, Michael Watt, Paul Misuraca, Greg Curtain, Reid Kennedy, Anthony Schembri and Andrew Joiner. The Trafalgar Holden Museum won the tourism award in 2016 with the judges aclaiming it as "A unique regional asset, whose small town location and many local exhibits epitomises the very Aussie icon showcased". The Manager and owner, Neil Joiner has invested over $100,000 in restoration work on the old dairy factory. All the labour was supported by volunteers. ​Work included cleaning, repainting, concreting, and restoring vehicles for display. ​About 15,000 people have visited the Museum, since it opened and volunteers are wanted to support the Museum. Also any donations made to the Trafalgar Museum (Not for Profit Organisation) will be really appreciated. Neil Joiner (manager) has always been interested in Holdens from a young age, and his favourite Holden is a 1965 HD Premier with leather seats. Neil's background is in the aircraft industry, where he learnt his trade at the Government Aircraft Factories in NDT (Non Destructive Testing). Neil started an inspection and testing business in 1985 with his wife Annette who was the backstop of the business which was sold several years ago. After selling the business Neil had some money to purchase some classic and vintage vehicles which form the backbone of the displays in its current form. Annette has been a major contributor to getting this new venture (Museum) off the ground. Two Melbourne brothers Mick and Greg Hodget decided to restore a 1953 FJ wagon wreck that had been rusting away in a driveway for almost 40 years. The car was originally built by a specialist body builder SH Cordell in 1955. ​He built about 12 of the wagons and today there would be very few, if any still around. Restoration work on the Holden wagon was carried out by Phil Monday and his team, who four months later and at a cost of over $222,000 had the car back to it's original pristine condition. Included in the car were venetian blinds and white wall tyres. GVC commenced the dream on 2nd April 2004. Grand opening display day on 15th October 2006. Over 10,000 visitors per annum - or over 200 visitors per week. In their 10 years of existence, that is approximately 100,000 visitors. Over 50 events, displays, and rallies in nearly ten years since opening. GVC receives over 100 visiting groups such as car-clubs and Probus each year. GVC membership is nearly 700, and over 450 Club Plates (registration of historic vehicles). GVC has been acknowledged as the No. 1 non-environmental tourist attraction in the Wellington Shire. They have a car cleaning group on a Friday, and a Touring Group that takes their cars and bikes to interesting places. Currently in the process of purchasing this Maffra building from a local company. They are looking forward to continued development of the Gippsland Vehicle Collection. Donations are really appreciated, as this helps develop their business plan in future years. ​New volunteers are always welcome and they currently have over 40 volunteers on their books. Members & Volunteers are the backbone of the organisation. Many hours have contributed to their current position. They are always looking for interesting vehicles to display at the GVC. New display of vehicles occur every 4 months. They also support the local community and business interests through facilitation of special events and collection of gate donations for local community and charity needs. Address: 1a Sale Road, Maffra, Victoria 3860. Phone 03 5147 3223, Secretary, After Hours, Phone 0409 667 096. Open hours - Friday to Monday 10 am to 4 pm, open school holidays, or by appointment. Museum Admission: Adults $10, Concession $8, Children under 15 Free, Members - Free. When you visit Phillip Island you "must see" this unique National Museum. It's an authentic experience. It is moving, educational, engaging and fascinating for adults and children of all ages. It has been rated in the top 10 Museums in Australia. The National Vietnam Veterans Museum is located in the picturesque setting on Phillip Island. Many people have asked why such a significant Museum is in a regional area, however the founder of this Museum was living in San Remo and thus by serendipity, here it is. NVVM evolved, rather than was planned. Starting from a mobile museum, driven around Australia by the founder and his wife, the Museum has undergone several growth stages to its present site, just over an acre, on Veterans Drive, Newhaven, where this building was officially opened 9 March 2007. The name of the road was chosen by the Board of Directors, when approached by the Bass Coast Shire Council to rename the street. Approximately 15,000 visitors came to the Museum last year and this figure is growing. They are enthralled by the exhibits and stories about the servicemen and women who served in Vietnam on their tour of duty. Exhibits include 4 helicopters, Wessex, Sioux, Cobra and Huey. Aircraft includes a Canberra Bomber, a Centurion Tank, an APC M113 armoured personnel carrier, vehicles including a Field Ambulance, dioramas, images and the renowned holographic Light & Sound Show. The Museum talks to you with interactive audio visual devices including InfoWands, which are a must to gain more information about the exhibits. Events are run throughout the year and the new exhibition - Unsung Stories, will run from 19 October 2016 until 30 April 2017. The Museum is a not for profit institution and a registered charity and is mainly run by volunteers who are engaged in a variety of tasks including restoration, customer service, guides and on the collections team. There are currently 70 volunteers working at the Museum and there is always a call out for more. Volunteers are placed where their skills are most valuable to the Museum. Places to visit or stay on Phillip Island - an hours drive (90kms) from Melbourne. After Colin and Maxine’s very successful manufacturing business Kiel Industries was relocated to a larger premises in nearby Morwell, and the children had also successfully moved on to live their own lives, Colin was able once more to pursue his old hobby. As with most MG owners, the natural progression is towards the marque of Jaguar. Colin has three Jaguars in his stable: 1934, 1949, and 1985. However Colin was looking for a real restoration challenge. He found it in a 1926, sleeve valve, Panhard et Levassor, a local barn find, which hadn’t seen the light of day since 1939. ​After twelve years, the car is immaculate, and a credit to the restorer. Over the years, several other vehicles have come into Colin’s collection, a veteran Star of Wolverhampton, a 1939 Vauxhall tourer (Maxine’s winery favourite to drive in), Studebaker, Chevrolet Corvette, and more. ​When Colin suggested that they should go to Paris in search of spare parts, Maxine had the bags packed in an instant. All housed in their old factory, Maxine and Colin decided to open their collection for others to enjoy. Other local car enthusiasts, from time to time, put their cars on display as well. They really enjoy the company of like minded enthusiasts. ​The museum provides a history of transport and memorabilia from the early 1900s to 2000s. It features not only Colin's car collection, but other locally owned classics. The museum is open by appointment only, with no minimum requirement, and entry is by gold coin donation. ​Coal Creek Community Park and Museum is a historical village which is located on the South Gippsland Highway, Korumburra. Set on 32 acres of land with 52 buildings and a collection of 30,000 objects, it tells the story of the history of coal mining and agriculture in the 1900’s in Korumburra and the South Gippsland region. Manned predominately by volunteers who operate an old fashioned General Store, Blacksmiths shop, Spinners and weavers, Bush tramway and other exhibits where volunteers pass on their stories of times gone by. The steam train “ Count Strzelecki” runs once a month in the non bushfire season. There are numerous events during the year and is available for clubs to book with onsite parking for vehicles and motor bikes. Pack a picnic lunch or cook a BBQ in the free carpark BBQs. Wedding functions can also be organised at the Museum. Their are currently 60 volunteers at the park and museum and more volunteers are required to support the village. ​Coal Creek is free entry to the general public. It is open Thursday to Monday between 10 - 4.30 pm. It is also open 7 days a week over the Victorian school holidays. Phone: 5655 1811 for more information. The site is a free day out for the family! It is approximately a 90 minute drive from Melbourne and is definitely worth a visit. All above ground activities are free. For a small fee venture underground on an underground tour. Tours run twice daily at 11.30 am and 2pm. Additional tours are run according to demand. There is a cafe and barbecue facilities on site and plenty of things to see. The state coal mine was developed to fuel the Victorian railways. The coal mine supplied both industry and domestic black coal from 1909- 1968. The State Coal Mine are always looking for new volunteers to join their site and help out. The Mine is run with a great dependence on the volunteer hours people give, contributing in many ways. Maintenance, gardening, front counter and underground tours are just some of the ways that volunteers can assist. The Mine also welcome donations of any original State Coal Mine assets that were auctioned off when the mine closed. Any period clothing or wares are also appreciated. If Visitors love their experience at the site and wish to support the State Coal Mine further, they can also donate financially to the Friends of the State Coal Mine. This money will be put back into the site, ensuring that the place can operate to the high standard you see today. If people wish to make any financial donations to the Friends of the State Coal Mine, they can do so on arrival. The 1927 Chevrolet was purchased new by Stan's cousin from a local dealership in Melbourne. He was a market gardener and used the Chevy to deliver his vegetables to the Melbourne markets. The Chevy unfortunately met a tree on the way home from market one day and subsequently was stored in a shed on the farm in Keilor. In the early 1990's the vehicle was restored by Stan, and used in many local Car Club activities, such as fun runs, car displays and to help promote local charities in festival parades. The vehicle is now displayed at the Wonthaggi Coal Mine, where it has it's own "Chevy" garage. It has been donated to the Wonthaggi Mine by Stan in the hope that it is the first of many vehicles to be permanently displayed at the Mine, ensuring these historic vehicles are available for all to appreciate. WPNP is breathtaking and is at the southern most point of mainland Australia. Covering approximately 50,000 hectares. A round trip walking will take a few days. There are many day trips throughout the park. There are caravan and camping sites as well as cabins and lodges and an information centre and museum. The Prom is serviced by rangers and during the school holidays talks and slide information are shown to the visitors. Surrounded by the waters of Bass Strait, the Prom has beautiful clean beaches, with swimming and fishing being a major attraction. 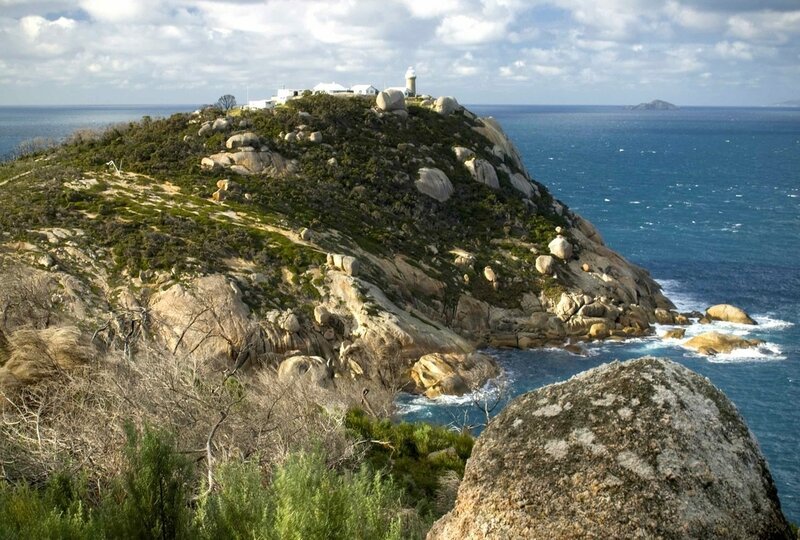 The Wilsons Prom Lighthouse is situated on South East Point and is the southernmost lighthouse on mainland Australia. It was completed in 1859. Built of Granite from a local quarry it is 19 metres tall. it is remote and can only be reached on foot. There are cottages on site whch you can sta for up to 2 days. It is approximately 200km (2-3 hours) from Melbourne CBD to Wilsons Promontory. You can go in a circle via Leongatha and Fish Creek and return along the coastline via Inverloch, San Remo and Phillip Island. The Bunurong Marine National Park is 2,100 ha in size and adjoins the Bunurong Marine Park and Bunurong Coastal Reserve. This no-take area follows the coast between the most southern headland west of The Oaks Beach and the headland at the eastern end of Eagles Nest Beach, and extends offshore for approximately 5 kms.​ It s about a 90 minute drive from Melbourne and is near the RACV Resort. Steeped in History this iconic Wonthaggi building (Circa 1915) ceased operations as a hotel in 1957. Originally built to service the coal miners and those arriving by train to the station that once was across the road, it has now been transformed into a unique B & B offering boutique style accommodation in a quiet location. ​They are directly opposite the Bass Coast Rail Trail, a 17km walking, cycling or horse riding trail that passes mining remnants, wind turbines and ends with panoramic views of the coastline. It is only a short stroll into town through the Wonthaggi wetlands where you can observe the native vegetation and wildlife. 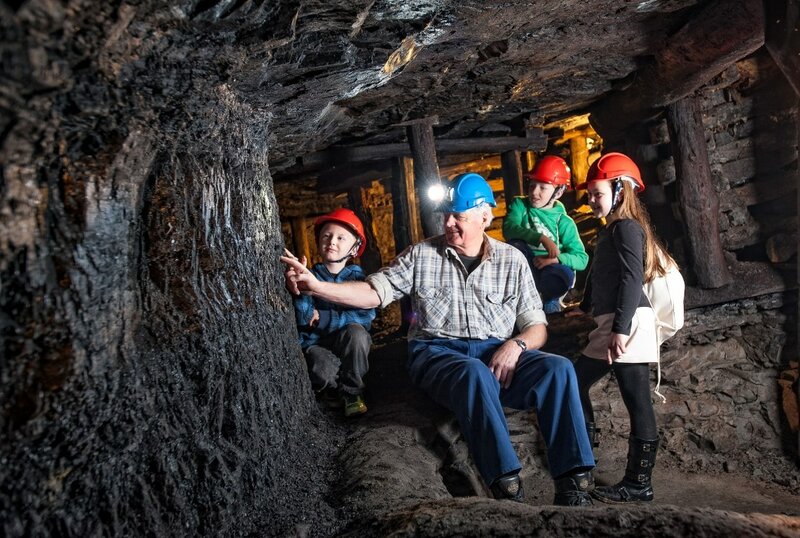 Visit the State Coal Mine that run underground tours daily and discover what life was like for the miners in the 1900s. Also close by are the local beaches, Inverloch, the local RACV Resort and Phillip Island which makes this the perfect location for your visit to the Bass Coast Region. ​Offering luxury upstairs accommodation all rooms are tastefully furnished with quality beds and linen. It also includes a kitchenette with bar fridge and tea & coffee making facilities. TV, WiFi and DVD are in all rooms. Continental breakfast is included or you can request a cooked breakfast. Contact Jeannie & Lance Crook for more information on 5672 4348 or mobile 0458 731 080. See 2 photos below. Places to see and stay in the Gippsland Region, Victoria. Bianca Biesuz Stefani is a noted and prolific traditional artist. Her gallery in Fish Creek is housed in a beautiful old Edwardian home, high on the hill on acreage with some beautiful views of the Gippsland region. Her art is in public and private collections world wide. Isn't it every artist's dream to showcase their artwork and be happy in their own environment? Whilst attending St. Laurence's O'Toole in Leongatha, Bianca had inspiring volunteer art teachers. She recalls being asked to depict in coloured chalk the nativity scene on a movable black board. This was used as a back drop for speeches and awards days. Boarding school years saw more brilliant teachers, one of whom still follows Bianca's art career. Sr.Mariana Handley had just finished a special arts course at Swinburne and was keen to impart her knowledge. She allowed this art student to use her oils and pastels out of school hours and during sport periods which suited Bianca. Not only did she win art awards in Sale up against technical school students, but her work hung in the Paraclete Art Show in Melbourne, a prestigious art show of work for Catholic Secondary School Students. When first married, she couldn't wait to sign her married surname when signing a commissioned work. Her husband Duilio also known as Will said to her, "You should sign your maiden name, its so arty". Yes, if only people could spell it or pronounce it. Biesuz is indeed an unusual Italian surname coming from the Veneto area of North East Italy. It is a known fact that in Italy and some other European countries, women retain their maiden surname. Major Art Galleries in the Gippsland Region and places to stay and eat. This exhibition is curated by Ann Dixon from her Bygone Days Historical Fashion Collection. Ann offered to display vintage and historical clothes from the collection that were made by famous couturiers such as Dior, Dolce & Gabbana, Patou, and many others. The collection in it's entirety has been offered to the Bass Coast Shire as a donation, which may be displayed in the future at a hoped-for Regional Gallery in Wonthaggi. This exhibition is a taste of the collection. Refer the website for more information.